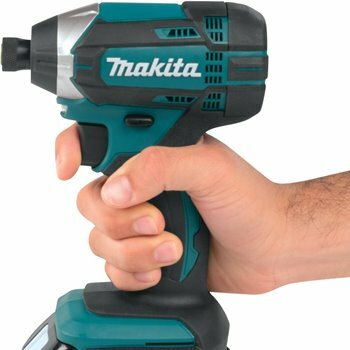 While not as big as a brand name as Dewalt or Black & Decker, Makita is often overlooked, even though this manufacturer offers very high quality cordless drills at a very affordable price. 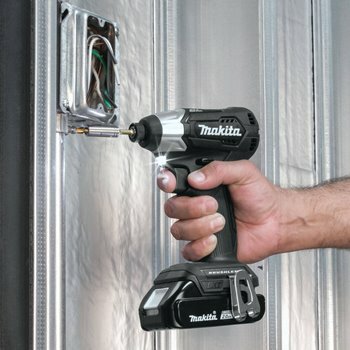 They produce an extended line of 12V and 18V cordless driver-drills and impact drivers in various combos/sets. 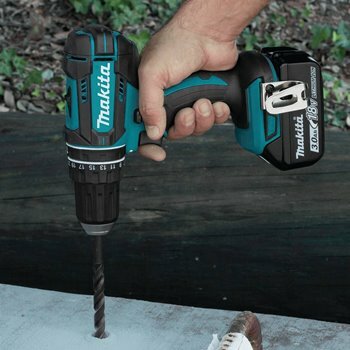 Let’s take a look at the top 10 Makita cordless drill kits and combo sets on the market. Makita’s engineers nailed it with this new 18V LXT sub-compact cordless drill and impact driver. For such a small body (driver drills weight is 2.8 lbs. ; impact driver 2.6 lbs. ), these cordless tools deliver a lot of power. They have 2 speed settings (0-500 and 0-1,700 rpm) with a brushless motor that delivers 350 in. lbs. of torque. These tools can handle just about any construction job and fix from building a wooden deck to fixing your yard fence. Being as compact as they are makes them easy to control in tight space. 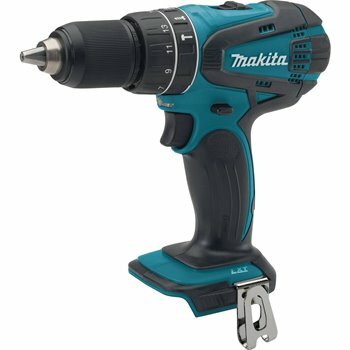 The cordless drill and driver are also equipped with Makita’s Star Protection Technology, which ensures the batteries do not get overworked. At a price range of $200-275 (depending on what package you purchase), it’s very tough to beat this cordless drill kit for the price. Tool kit includes both a driver drill and an impact driver. Compact build that’s easy to control, but still delivers a lot of power. Star Protection Technology prevents batteries from getting overworked. These are 18V cordless drills, so they may have some difficulty with super heavy-duty tasks like drilling through steel plates or very thick mortar mix. Bottom line: A bang for your buck that includes an 18V cordless drill and 18V cordless impact driver that can handle just about all home fixes and maintenance. State-of-the-art technology packed into a powerful cordless tool with a small body that’s easy to control. This is a fantastic 18V compact cordless drill and impact driver set for pro users. These power tools will handle every job that full-time contractors, electricians, or plumbers will face. The compact drill delivers 480 in. lbs. of torque, while the impact driver delivers a whopping 1,420. They both feature 2 speed settings for increased control through any job. 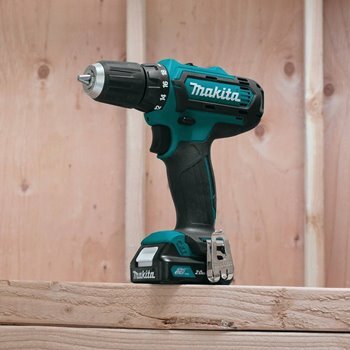 Both cordless drill and driver are equipped with Makita’s Star Protection Technology, which prevents the batteries from getting overworked and burning out. They also feature LED lights for low-light working environments. A combo kit the includes the two tools, two 2.0Ah batteries, a charger, and a carrying bag can be bought for $300-320 on Amazon. Professional grade – can handle any job for pros. Star Protection Plan keeps batteries from getting overworked. Relatively high price tag, but you will get two professional-grade and reliable power tools. 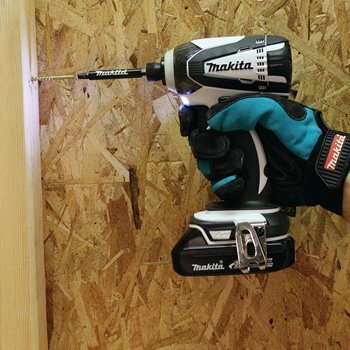 Bottom line: One of the best Makita has to offer in its 18V cordless drill/driver line. A great buy for full-time professionals like contractors, construction workers, electricians, or plumbers. The best of Makita’s 12V cordless drill and driver sets. If you’re looking for a set of Makita tools to keep in your garage for everyday household fixes and maintenance, this is the one to get. The 12V cordless drill has variable speed settings of 0-350 and 0-1,300 RPM that deliver up to 200 in. lbs. of torque and only weighs 2 lbs. The compact impact driver has speed settings of 0-2,400 and 0-3,000 RPM and delivers 800 in. lbs. of torque, quite powerful for a 12V tool. The price of the tool kit ranges from $130 to $230 on Amazon, depending on the package. For two cordless power tools to keep around the house for a long time, that’s a deal that’s hard to beat. Very compact and light weight. Great for everyday fixes and maintenance. LED light for low-light environments. Keyless chuck for easy bit changing. Not ideal for heavy duty jobs. Bottom line:If you’re a homeowner looking for an affordable and dependable cordless drill and driver set to have around for any home fixes and maintenance, don’t look further – this 12V combo set is a great one for the job. If you’re a pro or an avid DIYer looking for a beast of a cordless tool combo kit, this is the one you’re looking for. Two of Makita’s very best brushless cordless drills and impact drivers in one package. These two tools are equipped with all of Makita’s state-of-the-art technology including the battery gauge so you can tell how much juice is left in the tank; the Star Protection Technology that keeps the batteries from getting overused; the strong XPT construction that prevents damage from water and dirt and more. The tools have an efficient brushless motor that matches the torque and RPM to the power to the job at hand and prevents overuse. 4.0Ah batteries offer long battery life. XPT construction prevents damage from water and dust. Smart brushless motor matches RPM to torque to match the power of any job performed. High price (ranges from $270 to $430 on Amazon depending on which bundle you choose). Bottom line: A professional-grade 18V cordless drill and cordless impact driver set that’s one of the best options for full-time pros looking for a versatile, state-of-the-art tool set for a wide variety of applications. A bit pricey, but you’ll get great value for what you paid. Another member of Makita’s state-of-the-art 18V LXT cordless drill series, the XPH102 ½” hammer driver-drill is one of the top hammer driver-drills on the market. Its 4-pole motor delivers up to 480 in. lbs. of torque. It has 2 speed settings of 0-600 and 0-1,900 RPM, which makes it capable of handling a wide range of drilling, driving, and hammering jobs. This cordless hammer drill is also equipped with XPT (Extreme Protection Technology), which protects the tool from dust and water damage. If your day-to-day construction work is done in tough conditions and you’re researching the market for a hammer driver-drill, this is the one for you. The sets range from $110-$170 depending on the accessories, which is an incredible price for such a high quality cordless drill. Capable of drilling/driving/hammering through some of the toughest surfaces. Light ergonomic drill that weighs only 4 lbs. XPT technology protects the tool from dust and water. No toggle switch for the LED light. Bottom line: A great hammer driver-drill for work in tough conditions. Not ideal for concrete, but will handle just about any other material. Best of all, the price tag is very affordable. 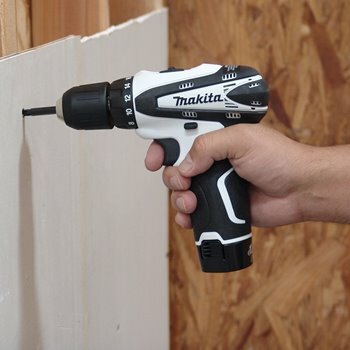 This is a very solid all-purpose 12V compact drill. Its lithium-ion batteries chargeing takes only 30 minutes, so you always have a reliable drill ready to go for day-to-day light fixes around the house or shop. Delivering up to 200 in. lbs. of max torque, this 12V cordless drill is great for jobs like building furniture or mounting shelves, but not ideal for heavy-duty professional jobs. It does come equipped with a built-in LED light for dark conditions and only weighs 2.2 lbs. This 12V max cordless drill can be purchased between $100-$130 on Amazon with 2 batteries, a charger, a hard case, and optional 38-piece bit set. Very light weight (2.2 lbs). Great for day-to-day light-duty jobs. Features a safety break for the chuck which is activated when releasing the trigger. This sometimes causes an abrupt stop to the drilling which causes bits to fall after use. Not ideal for heavy-duty jobs. Bottom line: This 12V drill is very affordable and great to have around for day-to-day fixes and maintenance around the house or shop. The light weight and compact design make it easy to use for anyone. This is an impact driver from Makita’s line of 18V LXT cordless power tools. It delivers great power (max torque 1,460 in. lbs.) and has 2 variable speed settings for total control (0-2,900 and 0-3,500 RPM). It’s equipped with a 4-pole, 4 brush motor that delivers 26% more RPM without reducing torque. In other words, this is a very efficient cordless impact driver. The housing is constructed of all metal gear, protecting it from outside forces in tougher working conditions. Price ranges from $120 to $170 on Amazon depending on the bundle. Equipped with Makita’s Star Protection Technology. Fast charging batteries (about 30 minutes). Powerful torque (1,460 in. lbs.) with efficient output. Weighs 4 lbs., a bit heavy for a cordless compact impact driver. Packages come with one battery, not two. Not meant for super heavy-duty material like concrete or stucco. Bottom line: If you’re looking for a Makita impact driver for either home or professional use, don’t look any further. While a bit heavy, this reliable and well constructed impact driver will deliver enough power to handle any medium-duty job. This is a no-nonsense 18V cordless drill kit. The 4-pole motor on this driver drill delivers up to 480 in. lbs. of torque with 2 speed settings of 0-600 and o-1,900 RPM. This compact drill can handle a wide range of materials from plastic to wood to light-medium metals. Because its not 20V, it may be challenged by heavy metals and concrete, but can cleanly handle the rest. It comes equipped with a strong LED light for dark areas and lithium-ion batteries that tend to last quite a while. Can handle just about any materials other than heavy-duty ones like concrete/thick metals. Not equipped with the Star Protection Technology which protects from overworking the drill – one user reported the tool caught fire because of this. Bottom line: A solid 18V cordless drill for anything from DIY jobs to everyday contracting, plumbing, and car shop work. It’s not meant for super heavy jobs and isn’t protected by the Star Protection Technology like some of Makita’s other tools, so just be careful not to overuse it. Here is a 18V cordless drill and impact driver combo that also offers tools from the popular LXT series. This combo comes with the 18V lithium-ion hammer drill (a very similar hammer drill to the fourth product reviewed above, but with a little less RPM), an 18V cordless impact driver with variable speed (0-2,300 RPM & 0-3,200 IPM) and 1,420 in. lbs. of torque, 2 2.0Ah batteries, a charger, and a case. 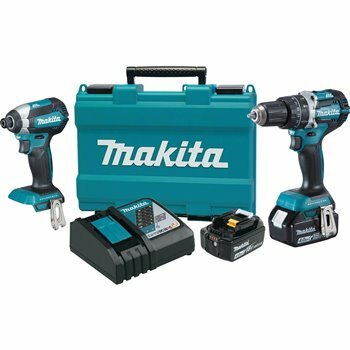 This is a great offer by Makita that ranges between $199 to $250 depending whether you add any accessories. You will get two tools that are very capable of handling any job around the house or garage from hanging drywall to fixing cars. 2 reliable and versatile tools at a low cost. XTP technology protects the tools from water and dust. Not the top of the line Makita cordless impact driver and hammer driver-drill. Not ideal for heavy-duty material and jobs. Bottom line: While the set doesn’t come with Makita’s best impact driver and best hammer driver-drill, it’s still very reliable and perfect for non-professional day-to-day use. 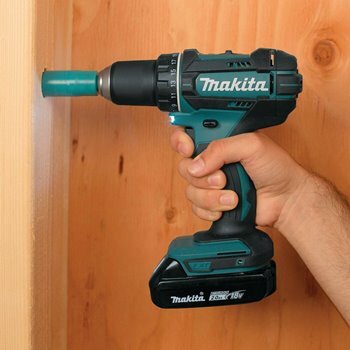 This Makita 12V driver-drill can tackle a range of day-to-day fixes and maintenance around the house. As with all of the Makita drills we covered, it has 2 speed settings (0-450 & 0-1,700 RPM). It delivers up to 250 in. lbs. of torque, which is very respectable for a 12V cordless drill. Drill kits that include two CXT lithium-ion batteries, a charger, a case, and other accessories range between $100 to $150 on Amazon. Very light and compact (2.4 lbs. with battery) and 7” long. Delivers relatively high torque for a 12V drill (250 in.lbs.). Good for basic drilling, driving, and fastening jobs, but may have a hard time with anything more challenging. There are similar 12V out there that are cheaper. Bottom line: A great tool for drilling, driving, and fastening applications, but may have a hard time with heavier jobs. If you’re a homeowner looking for an affordable tool to keep around for basic fixes and maintenance, this will do the job day in and day out. So there you have it! Whatever the job at hand, there is a wide range of products you can find in a wide range of pricing. Make sure to consider your needs when shopping around. We are positive that whichever Makita drill or driver you decide to use, you will not be disappointed!